Five Finger Death Punch and Breaking Benjamin are currently crushing city after city on the summer’s hottest hard rock tour de force. They are joined by Grammy-nominated rockers Nothing More, and 2018’s number one buzz-band, Bad Wolves. The four acts descended upon the Pacific Northwest this week, and Metal Nation caught up with them at Boise’s Taco Bell Arena. Despite the early 6 p.m. start time, the venue was halfway full by the time Bad Wolves took the stage. It’s not surprising that Bad Wolves has exploded onto the modern metal scene. The band is propelled by the powerhouse vocals of Tommy Vext (Snot, Divine Heresy) and former DevilDriver drummer and co-founder, John Boecklin. The quintet also includes the talent of former God Forbid guitarist Doc Coyle, bassist Kyle Konkiel (Vimic, ex-In This Moment), and Bury Your Dead guitarist Chris Cain. Bad Wolves hit the stage with the djenty opener, “Officer Down” from their debut album, Disobey. They followed this with “Learn to Live” and “No Masters”. Vext took control of the crowd like a seasoned pro and quickly rallied the audience into a feeding frenzy. Bad Wolves brought tour guest Diamante onstage for the track, “Hear Me Now”. She’s supporting her own debut album, Coming in Hot. The set closed with “Better the Devil” and the band’s highly regarded cover of The Cranberries, “Zombie.” The band’s Boise debut proved a strong success. While it can be difficult for a support act to upstage or overshadow the headliners, San Antonio quartet Nothing More demonstrated its ability to do just that, standing out as perhaps the strongest performance of the evening. Frontman Jonny Hawkins hit the stage, barefoot and bare-chested pounding on a second mini-set of drums in front of guitarist Mark Vollelunga, bassist Daniel Oliver and drummer Ben Anderson. Hawkins seized the crowd’s attention with his intense and charismatic performance which carried throughout a tightly-crafted nine-song set. They opened with “Do You Really Want It?” as funnels of smoke shot into the air across the front of the stage. The song that served as the first of five tracks from Nothing More’s newest album, The Stories We Tell Ourselves, which has already garnered the band three Grammy nominations. Songs like “Don’t Stop” and their monster hit, “Go to War” followed, before they slowed the pace for the poignant ballad, “Just Say When”. The group’s harmony vocals absolutely shined on every track. They tackled loss on “Fade In/Fade Out” before diving into their self-titled album for the hits; “Jenny,” “Ocean Floor,” and “This is the Time (Ballast)”. Hawkins returned to his mechanized drum stand, called The Scorpions Tail, for the band’s final track; the Skrillex cover, “First of the Year (Equinox)”. Hawkins rose 14 feet in the air on the tail and added electronic and digital effects as he rode the contraption. With the drop of a stage-width curtain, Pennsylvania’s Breaking Benjamin took the stage next, opening with the darkly moody track, “Red Cold River.” The song served as the first of three tracks performed from the band’s new album, Ember, from which they also played “Torn in Two” and “Psycho”. Frontman and band founder Benjamin Burnley led the way, but the show broadly featured every member of the group as well as a series of special effects including flame spouts and smoke shooting into the air on a regular basis. Breaking Benjamin turned in the longest set of the evening delivering 15 songs, including a 10-minute medley of covers such as “The Imperial March,” Tool’s “Schism ,” Nirvana’s “Smells Like Teen Spirit,” Pantera’s “Walk, and Metallica’s “Sad But True” plus a drum solo from Shaun Foist. The crowd sang along with every song, often so loudly that one could barely hear the band’s own vocals. The set-list included tracks from the breadth of their work. From 2009’s Dear Agony came “I Will Not Bow,” and from 2004’s So Cold EP they played “Blow Me Away”. Digging back to their 2004 break out album, We Are Not Alone, the band performed “So Cold,” “Sooner or Later,” and “Believe”. The latter two featured guitarist Keith Wallin and bassist Aaron Bruch on lead vocals respectively. Other songs performed included the hits; “Angels Fall,” “Failure,” “Never Again,” “Breath,” and “Until the End”. For the set finale, Burnley brought over a dozen children onstage to join the band for “The Diary of Jane”. In all, it landed as a strong set from one of today’s best live acts. 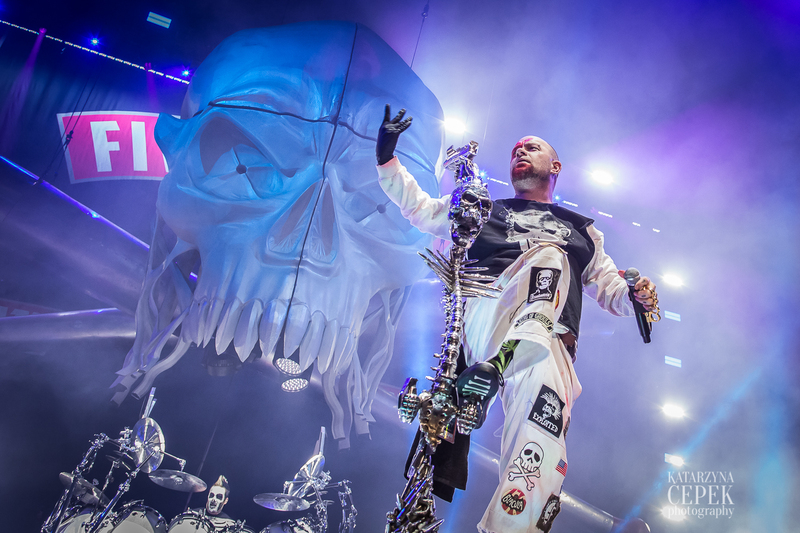 Closing out the night were the heavy metal makers of mischief, Five Finger Death Punch. The hard-rocking wrecking crew is out in support of its new album, And Justice for None. The band’s stage set included a huge skull hanging center stage, with a backdrop of crisscrossed metal bats in front of the band’s massive logo banner. Drummer Jeremy Spencer sat behind his massive kit decked out in his skeleton garb and make-up. Jason Hook hit the stage with one of his trade-mark military-stripe painted guitars while bassist Chris Kael and guitarist Zoltan Bathory followed suit. The always entertaining and enigmatic Ivan Moody attacked the stage last, and launched the band into the arena anthem, “Lift Me Up.” He and Kael traded lead vocals on the track, which was the first of an oddly short set that only went 12-songs deep. “Trouble” followed and “Wash It All Away” provided a slower moment. They tuned up “Jekyll and Hyde” from 2015’s Got Your Six album, before bringing Tommy Vext back to the stage for the band’s cover of “Bad Company”. Moody announced the song as a tribute to all service members, law enforcement officers, and fire personnel. Next, Five Finger throat-punched the crowd with their new single, “Fake,” before Hook and Moody dialed it down for acoustic renditions of “Wrong Side of Heaven” and “Remember Everything”. The tempo picked up again for the raucous anthems “Coming Down” and “Burn MF”. Moody had a piano wheeled onstage to intro the Offspring cover, “Gone Away” which he dedicated to the late Vinnie Paul. The band went “Under and Over It” next, and after talking with the crowd about his new found sobriety, Moody and company ended the night with a blistering turn of “The Bleeding” replete with confetti cannons and full on visual assault. They then stayed onstage throwing picks and sticks to the crowd as “House of the Rising Sun” played overhead. As they always do, Five Finger Death Punch served it up hard and heavy, but it would have been nice to get another two or three songs in the set from a headliner with a wealth of strong material. That said, the entire crowd talked animatedly on the way out of the venue about what an incredible show they had witnessed from four stellar artists.